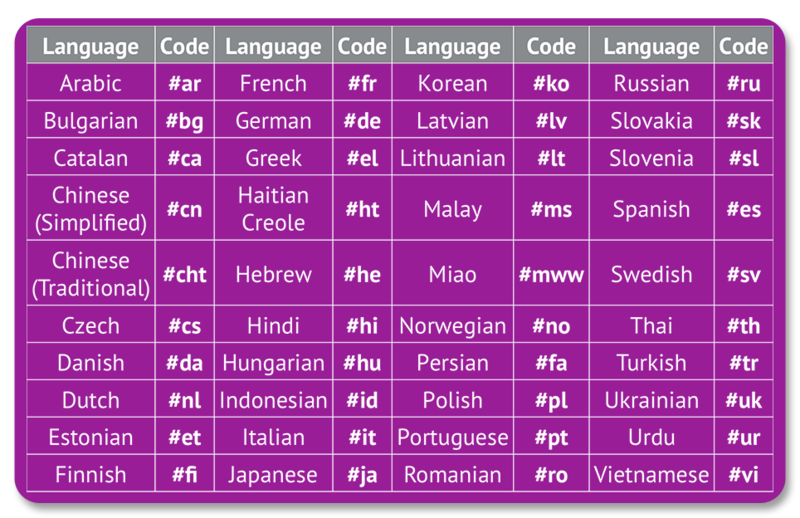 A new language is a life-changing skill that can create opportunities! Muuzii is proudly the Official Mobile Translation Service Supplier for the 2015 World Police and Fire Games! Muuzii - It’s not just translation, it’s connecting! We are a mobile education technology company. 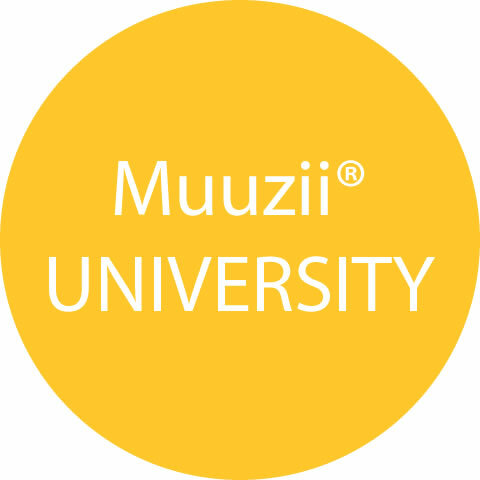 Muuzii® is the innovative company that brings language translation and language learning to people’s need and desires to communicate with others in a simple and easy-to-use platform simply using their mobile phones. Muuzii®’s service, is NOT an “app” but uses text messaging to deliver its services and will work on any phone, not just smart phones and doesn’t need to be connected to an expensive data plan or to a Wi-Fi hotspot. Muuzii® ENTERPRISE is a powerful platform that provides enterprise customers (commercial companies, non-profit organizations, government agencies, or NGOs) a unified system to provide their employees, customers and/or constituents valuable resources, information, language translation and language learning services simply through their mobile phones. All of Muuzii®’s product and services are simply uses text messaging to deliver its services and will work on any phone; Muuzii® is not an “app” and not just smart phones and Muuzii® doesn’t need to be connected to an expensive data plan or to a Wi-Fi hotspot to work. 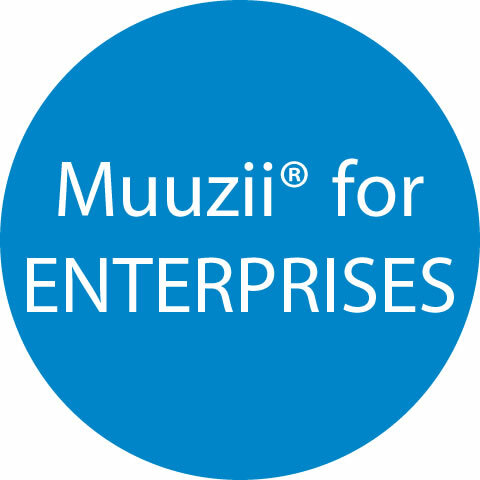 Muuzii® ENTERPRISE is a comprehensive, unified management platform that provides customers a system for providing, accessing and managing their use of Muuzii®’s language translation and language learning services for their employees, customers or constituents. The platform also brings powerful features and capabilities that include broadcast messaging in any of 41 languages, sharing surveys and questionnaires in any of the 41 languages, and comprehensive reporting of transactions. Muuzii® TAGGING is a powerful feature and capability provided under Muuzii®’s ENTERPRISE platform that allows the operator to create unlimited Muuzii®’s services are all tied to a subscriber’s mobile phone number as all of Muuzii®’s services are delivered to that subscriber’s mobile phone. 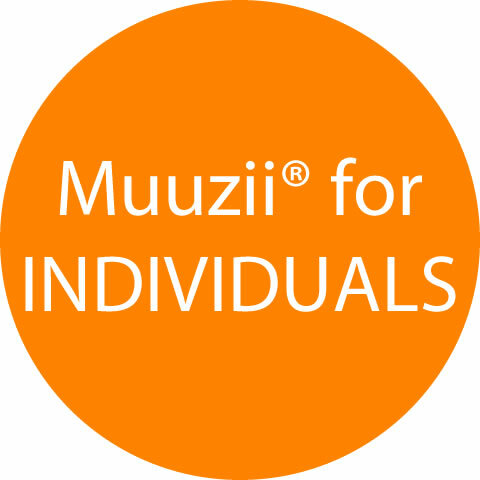 Muuzii® PUSH capability, when combined with Muuzii® TAGGING feature allows an organization to broadcast specific messages, surveys, questionnaires and tests to selected users, based on filtering TAGGING criteria, as well as scheduling such broadcast messages to specific users of specific dates. Muuzii® ENTERPRISE platform supports sharing surveys and questionnaires with subscribers, allowing organizations to interact with subscribers for their opinions and stated needs. And for students, Muuzii® platform allows organizations to send quizzes/tests to validate the quality of instruction and understanding. Muuzii® UNIVERSITY is currently available for both Chinese and Spanish. Muuzii® Individuals is a platform that provides anyone with language translation and language learning services through their mobile phone. Muuzii®’s service, is NOT an “app” but uses text messaging to deliver its services and will work on any phone, not just smart phones and doesn’t need to be connected to an expensive data plan or to a Wi-Fi hotspot. 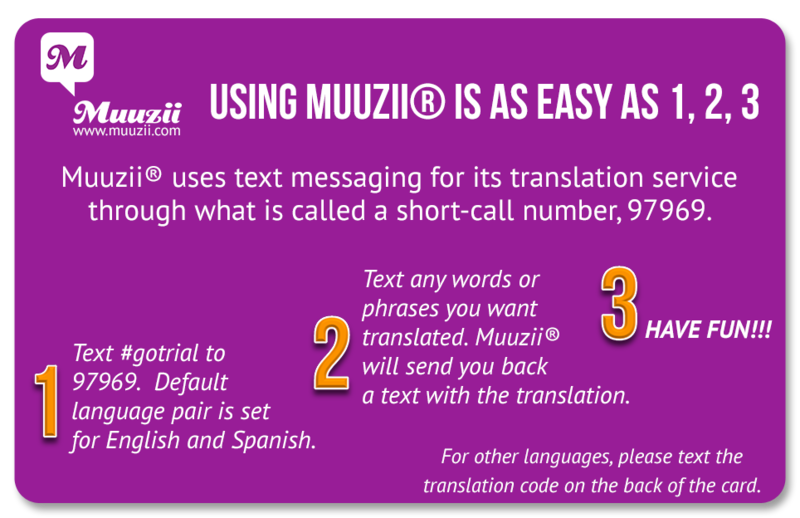 Muuzii®’s baseline service is a real-time, on-demand, language translation service that delivers translations between English and 40 languages by simply using text (SMS) messaging. THEREFORE, IF YOU CAN TEXT, YOU CAN TRANSLATE. Muuzii® works on any phone, any time, and anywhere, even when traveling internationally. 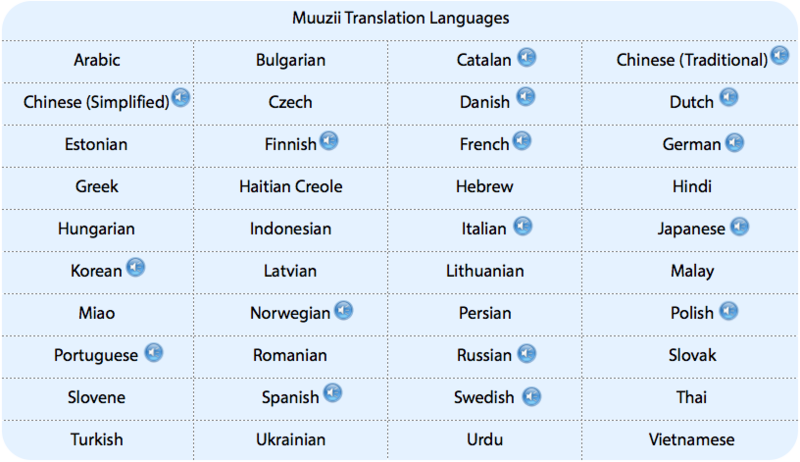 And because Muuzii is not an “app” limited to smartphones only, Muuzii® offers users the most universal and flexible language translation tool available today. As an added feature to the baseline mTrans product, Muuzii® also offers a powerful product called mSPEAK, that expands mTrans’ capabilities to not only accomplish translation as a text message but it also sends an audio file of the translation that can be played on the mobile phone. The subscriber can then play the audio file to either communicate with another person, or to use that audio file to help them with pronunciation of the translation. Muuzii® invites you to try our flagship language translation service, mTrans, before making a commitment to subscribe because we are confident you’ll love using Muuzii®. Our free trial provides you FREE access to Muuzii®’s language translation service between English and 40 languages. The trial will allow you to use Muuzii®’s translation service for FREE for 7 days, up to 10 messages per day. START YOUR FREE TRIAL NOW BY TEXTING #gotrial TO MUUZII®’S SHORT CODE NUMBER 97969.